CNG: The Coin Shop. Moneyer issues of Imperatorial Rome. L. Hostilius Saserna. 48 BC. AR Denarius (20mm, 3.76 g, 3h). Rome mint. Moneyer issues of Imperatorial Rome. L. Hostilius Saserna. 48 BC. AR Denarius (20mm, 3.76 g, 3h). Rome mint. Head of Gallic captive (Vercingetorix?) right, wearing hair flowing back and long, pointed beard, and a chain around his neck; Gallic shield to left / Two warriors in galloping biga right: one driving, holding whip in right hand and reins in left, and the other, facing backward, holding shield in left hand and brandishing spear in right; L • HOSTILIVS above, SASERN below. Crawford 448/2a; CRI 18; Sydenham 952; Hostilia 2; RBW 1569. VF, darkly toned, areas of weak strike at periphery, small scratch under tone on neck of portrait. Ex Seaby Coin & Medal Bulletin 710 (October 1977), no. C791. The obverse portrait has sometimes been identified as the famous chief of the Arverni, Vercingetorix, whom Julius Caesar captured in 52 BC in Alesia. It is difficult to imagine anyone placing such a dramatic portrait of a defeated foe on their coinage, but it is clear from surviving sources of the period that the Romans had a good deal of respect for the Gauls as honorable warriors. Crawford and Sear believe this identification is unlikely, but the large, distinctive, and carefully engraved head suggests the die cutter worked with an eye toward creating an individualized portrait, rather than a stylized personification of a Gaul. 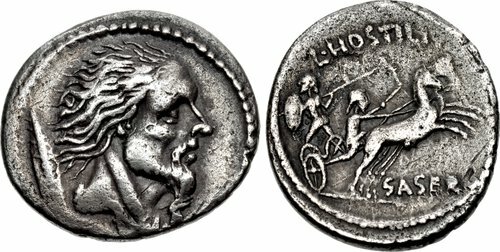 The reverse is also of particular historical interest, in that it depicts the manner in which chariots were used in Celtic Gaul, and perhaps in Britain as well.